Our bodies need fuel, food, to provide energy for our bodies to function, this energy is often quantified in terms of kilocalories, (Kcal). On average, a man will require 2800Kcal – 3000Kcal a day and a woman 2000Kcal – 2200Kcal. When we exercise this demand will increase, and we might burn another 1000Kcal on a long day out in the mountains. These figures are somewhat generalised, our metabolism slows as we get older, using less energy, and there are always variations between individuals. To provide a constant and regular supply of fuel when in the mountains we need to pay attention to what we eat and drink. 1. Fuel up at the start of the day. 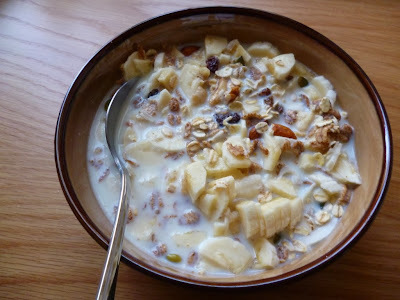 Don’t miss breakfast, and eat complex carbohydrates which release energy slowly, porridge with honey is good, as is muesli with dried fruit and nuts. A cooked breakfast will also give you plenty of fuel for the day, bon appetite! 2. At your lunch stop refuel with more slow energy release foods, oatcakes, bananas and peanut butter sandwiches are all good examples. 3. In winter conditions it may not be possible to take a break at lunchtime, you may be on an exposed ridge or a windy and cold summit and need to press on and seek a more sheltered spot later. To avoid an energy drop at these times, graze on complex carbohydrates during the day, dried fruit, nuts, and cereal bars are good options, avoid high sugar foods like chocolate, which give you a quick high but no lasting energy boost. 4. It is essential to drink plenty of fluids, especially in warm weather, dehydration is a best tiring, and at worse, life threatening. It is generally recommended to drink 2 litres a day, but in reality this varies with individuals, the weather, and the severity of the hike. On a hard day in very warm conditions you may need to drink 4 litres, on a cool day maybe 1 litre will suffice. Experience will teach you your own requirements. It’s best to avoid caffeine rich drinks, like tea and coffee, as these are diuretic and will make you pee more. For a warming drink try hot chocolate, or my favourite, rosehip tea with a spoonful of golden syrup. In warmer conditions try fruit juice diluted 50:50 with water, this provides essential salts as well as hydration. 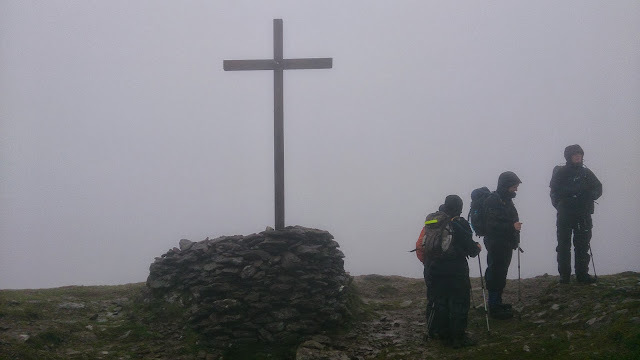 Mountain summits do not always make the best lunch spots. 5. Finally, it is important to refuel with some carbohydrate when you get off the hill, maybe the remains of your snacks or lunch, and try to eat your evening meal within 2 hours of ending the hike. This will give you muscles the energy and protein they need to repair the micro tears that your strenuous day on the trail will have caused. Previous postHill Skills Series – Winter hillwalking – layering for cold weather comfort.